You have purchased a new high definition television and the image is stunning, but the audio... Well, not so much. This is an issue that is very common today, especially as newer model TV sets take on an even slimmer form factor. While this looks great, it doesn't leave much room for quality speakers. The most common way to solve this deficiency is to connect the TV to an external audio system. Now you find yourself faced with a new problem. This new TV doesn't have any RCA sockets to connect to your audio system. 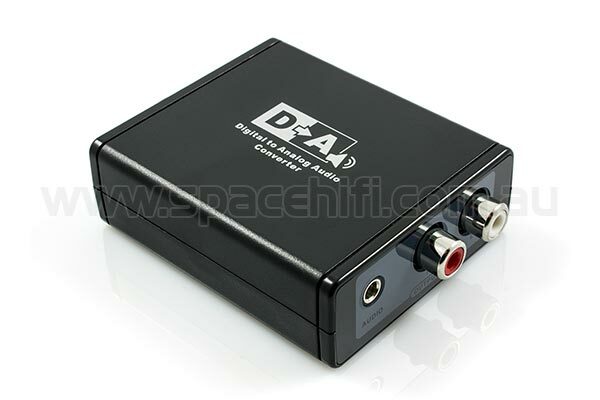 Instead you will find a digital audio output (S/PDIF) which can accept either an optical cable or digital coaxial cable. While this is the perfect connectivity option for almost all modern home theatre systems, those with legacy audio systems may not have digital audio input connections available. Thankfully, there is a very simple solution. To connect your high definition television to an audio system via RCA cables, all you need is a Digital to Analog Audio Converter. These fantastic, compact devices will convert the digital audio signal to analogue and output via RCA (to connect to a stereo audio system) or 3.5mm (to connect to headphones). To set up one of these devices is actually an extremely easy process. After confirming that your TV has a digital audio output, you will then need to check if you require an Optical (Toslink) Cable or a Digital Coaxial Cable for this connection. If connecting to a stereo audio system, you will also need a Stereo RCA Cable. Alternatively, if connecting headphones you will need to ensure that these have inbuilt volume control. Once you have all the required accessories, you will need to go into your TV set up menu and locate the audio output settings. Here you will need to ensure that the digital audio output is set to LPCM. This is basically uncompressed audio which is required for this converter to perform correctly. If this option is not available (this setting is not available on some TV's), then you may need to consider a Digital to Analog Audio Decoder instead. This device offers all the features of the unit outlined above except that it also includes support for Dolby Digital and DTS audio decoding. Next, all you need to do is simply connect either the optical cable or digital coaxial cable to the Digital to Analog Converter (or Digital to Analog Audio Decoder if this is required as outlined above) and then connect the audio converter to your stereo system via the RCA cables (white for the left channel and red for the right channel). Alternatively (or even at the same time), connect your headphones to the 3.5mm connection. That's it, you're all set to enjoy higher quality audio to complement that superb high definition image.